Ned Kelly was not just Sidney Nolan’s subject, but his alter ego, writes David Rainey. To coincide with the opening of “Sidney Nolan’s Ned Kelly Series” at the Art Gallery of Western Australia on August 11, Rainey provides a fascinating insight into the work of one of Australia’s most iconic artists. 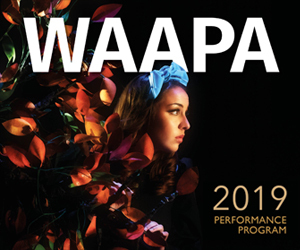 Ned Kelly is visiting the Art Gallery of Western Australia (AGWA); or to be more precise, 26 Kelly-themed paintings are making their first visit to the West. A recent excursion by Kelly himself to these parts, however, went largely unnoticed and eluded the vigilance of many. Ned Kelly sighted at Lower Chittering. Here is a little known tidbit of bushranging history: Joseph Johns, aka Moondyne Joe, was a childhood hero of Kelly, who revered the Welshman-turned-bushranger. Seesaw can now reveal that Kelly, weaned on the teat of Moondyne bravado, posthumously visited the West in search of his alter ego. He was captured, so to speak, whilst surreally taking cover behind a telegraph pole outside the Lower Chittering Volunteer Fire Station. Later that day he bailed up the Year 3 class at Toodyay Primary, holding children hostage until they painted his portrait. The images collected here seem to corroborate the Chittering sighting. Kelly’s appearance at AGWA, then, is a return visit, but one that is much better publicised than his first. More seriously, it is fascinating to consider “Sidney Nolan’s Ned Kelly Series” in terms of what will and will not be seen. Nolan said that Kelly’s own words were ingredients in these paintings, and so here I borrow Nolan’s own words to tell the tale. First though, a more conventional summary. In April 1946, Nolan visited Glenrowan, the site of Kelly’s capture, with fellow “Angry Penguin” Max Harris. He had already painted at least one of the so-called “first series” Kellys and would complete them over the next 15 months. With one exception they were painted on the dining table at Heide, the home of wealthy modernist art enthusiasts John and Sunday Reed with whom Nolan had lived in a ménage à trois since the collapse of his first marriage in 1941. In July 1947, soon after he painted The Watch Tower, Nolan left Heide, and would return only briefly. The parting was strained, and his relationship with the Reeds became increasingly acrimonious over time – his second marriage, to John Reed’s sister Cynthia in March 1948, but the first barrier. At the time he readily conceded, “I do not even feel that the Kellys belong to anyone else other than Sun” (1) and cooperated with the Reeds in selecting 27 paintings from the total of about three dozen which remained at Heide. He assisted in providing text for their initial public hanging at the Velasquez Gallery in Tye’s Furniture Store in Melbourne in April 1948. Do try to locate that robin in this exhibition. It’s there to be seen in one of the works, a visual signature by Nolan referring to the alias “Robin Murray”, which he used when absent without leave during and after the war. In 1977, Sunday Reed gave 25 of the 27 Kelly paintings, “with love” as she insisted the deed record, to the National Gallery of Australia – one, Death of Sergeant Kennedy at Stringybark Creek, having been privately purchased from Nolan when it was first exhibited in May 1946; and a second, First Class Marksman, having been re-acquired by Nolan. First Class Marksman has been exhibited with all the others on only a few occasions, the last in 1997. Marksman will not be making an appearance at AGWA. It has always been the outlier – the only one not painted at Heide but at Vassilieff’s home “Stonygrad,” the only one not in the collection of the National Gallery of Australia but rather with the Art Gallery of New South Wales, and the only one that reverted to Nolan’s own possession. It holds the record for the highest price achieved at auction by an Australian artist – $5.4 million in 2010. In the mid-1960s, Max Harris railed against British critics who lionised the Kelly paintings as “a deep and complex interpretation of a myth of Australian nationhood, and a unique view of the relationship of the Australian man to his environment. Australians, say the subtle London critics, tend to lose their identity, become iron masks behind which is nothing, in the harsh Australian landscape”. There are certainly similarities between the painted and painter. Both were fugitives from the law – Kelly a bushranger with a price on his head, Nolan absent without leave from the army; both had Irish roots, although Nolan’s much-vaunted Irish heritage was Northern Ireland Protestant, not the Catholic roots of Ned Kelly. Nolan never bothered to correct this misapprehension – over time it would serve him well. Sidney Nolan, ‘Burning at Glenrowan’, 1946, from the Ned Kelly series 1946 – 1947, enamel paint on composition board, 121.50 x 90.70 cm, Gift of Sunday Reed 1977, National Gallery of Australia. Other images invite speculation. Does the figure of Mrs Reardon, seen in the Glenrowan paintings fleeing the burning inn with her young daughter, bring to mind Nolan’s first wife Elizabeth fleeing the conflagration at Heide with their young daughter Amelda? Indeed, it is a remarkable coincidence that an untitled painting of this time, known as Mrs Reardon and Child goes to auction in Sydney just two days before the AGWA show opens. (6) This work adds credence to the above speculation. Nolan kept this painting all his life and on his death in 1992 it went to Amelda. Dated 27 January 1946, a period of intense personal turmoil for Nolan – in July 1945, Elizabeth had been granted a divorce on the grounds of his desertion, and two months later with Nolan deserted from the army, his young brother Boy drowned in Cooktown on return from active duty – the pervasive lyrical beauty of this painting reaches into this 21st century with a poignant tranquility. We can also speculate as to why Nolan cut the original six-by-four-foot Glenrowan painting in half to produce the Burning (above) and the Siege. Was it simply because Peter Bellew suggested it was too large, or is there something more significant about the parting? And, in The Watch Tower – based on a photo of Longreach in Walkabout magazine and the very last of the first series Kellys – did Nolan replace a very look-alike figure with a trooper? 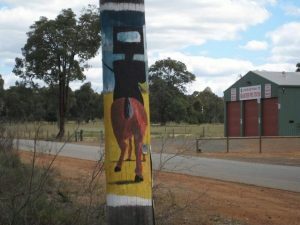 He painted it only a few weeks before departing Heide at a time when he was surely on the lookout to get out. 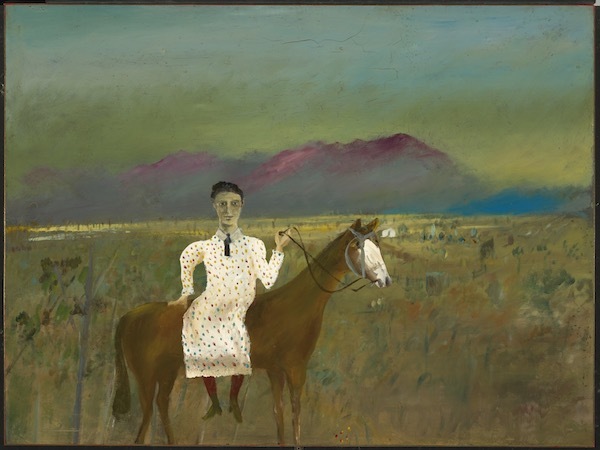 Sidney Nolan, ‘Steve Hart dressed as a girl’, 1947, from the Ned Kelly series 1946 – 1947, enamel paint on composition board, 90.60 x 121.10 cm, Gift of Sunday Reed 1977, National Gallery of Australia. The Rousseau influence can be seen nowhere better than in comparing Rousseau’s painting War to the clouds of Nolan’s Encounter, and to the black steed of his Evening. Be sure to concentrate on the light when you visit these paintings. And if perchance, like quite a few others, you have trouble with Nolan’s rather naively styled portrayals of characters in the story, simply ignore them and imagine the paintings without any figures at all. Imagine just the landscapes. 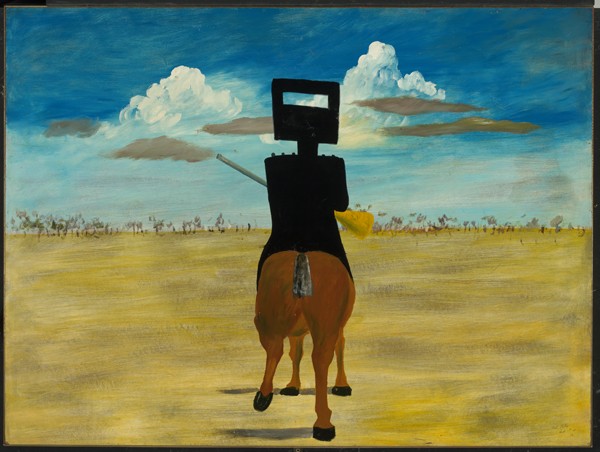 Sidney Nolan, ‘Ned Kelly’, 1946, from the Ned Kelly series 1946 – 1947, enamel paint on composition board, 90.80 x 121.50 cm, Gift of Sunday Reed 1977, National Gallery of Australia. Friedrich’s painting Monk by the Sea, the quintessential image of the Romantic sublime, brings to mind so clearly those marvellous last words in Randolph Stow’s novella To the Islands. Heriot, the ageing disillusioned mission station supervisor up in the Kimberley, has walked a metaphorical end-of-days journey to the coast with his young Aboriginal friend. He looks out over the Arafura Sea to the Aboriginal islands of the dead: “‘My soul,’ he whispered, over the sea-surge, ‘my soul is a strange country.’” Could any words better evoke the ethos of Friedrich’s Monk by the Sea? 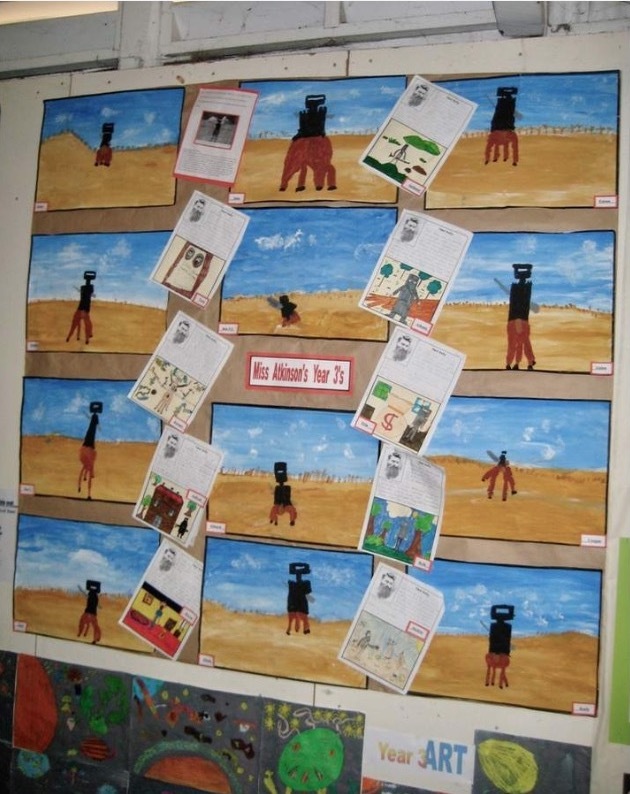 or of Nolan’s Ned Kelly? One may think of it as the spinifex of dry souls. but a man unwounded in his loneliness? and swamped me. I was bushed for forty years. And I came to a bloke all alone like a kurrajong tree. With time, perhaps Nolan discovered a personal Via Dolorosa in the Kelly paintings. This article was first published by David Rainey: www.acomment.com.au/2018/08/ned-and-sid-sublime-at-agwa/ and is published here with kind permission from the writer. “Sidney Nolan’s Ned Kelly Series” shows at the Art Gallery of WA, August 11 – November 12. 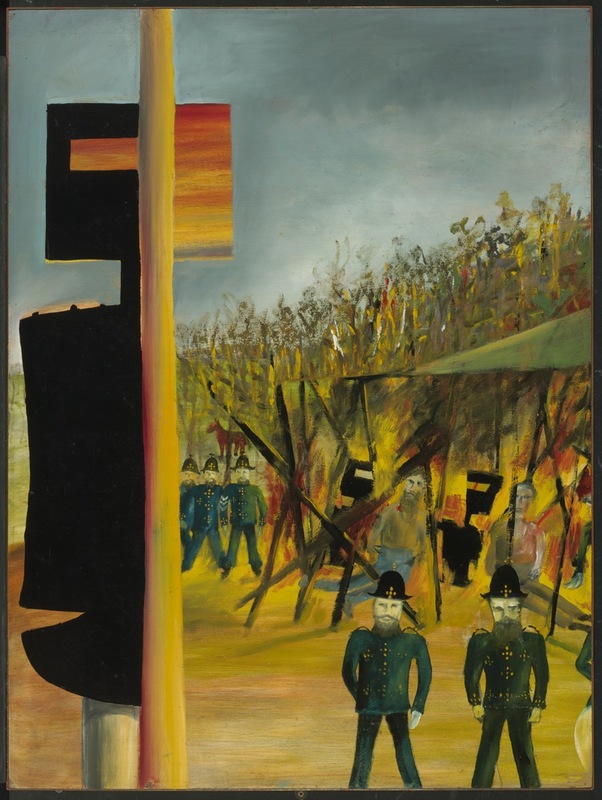 Pictured top: Sidney Nolan, ‘The trial’, 1947, from the Ned Kelly series 1946 – 1947, enamel paint on composition board, 90.70 x 121.20 cm, Gift of Sunday Reed 1977, National Gallery of Australia. 1 Sidney Nolan, Letters to John Reed, 14 January 1948, Papers of John & Sunday Reed, Australian Manuscripts Collection, State Library of Victoria, MS 13186, Box 2, File 6. 2 Sidney Nolan, “Fidelio”, in Paradise Garden, R Alistair McAlpine Publishing Ltd, London, 1971, p. 53. 3 See Sidney Nolan interviewed by Michael Heyward, London, 5 April 1991. 4 Max Harris, “Conflicts in Australian Intellectual Life”, in Literary Australia, Ed. Clement Semmler and Derek Whitelock, F W Cheshire, Melbourne, 1966, p. 22. 5 Sidney Nolan, comments made to Elwyn Lynn on 6/9/1984 published in Elwyn Lynn, Sidney Nolan’s Ned Kelly, ANG, 1985. 6 see https://www.menziesartbrands.com/items/untitled-mrs-reardon-child-0 , downloaded 2 August 2018. 7 Sidney Nolan quoted by Colin MacInnis, “The Search for an Australian Myth in Painting”, in Kenneth Clark et al, Sidney Nolan, London: Thames and Hudson, 1961, p.30. 8 Interview with Peter Fuller, “Sidney Nolan and the Decline of the West: A Modern Painters Interview with Sir Sidney Nolan,” Modern Painters, Vol.1, No.2 (Summer 1988); quoted in Nancy Underhill, ed., Nolan on Nolan: Sidney Nolan in his Own Words (New York: Penguin Group Inc., 2007), p. 344. 10 Randolph Stow, Outrider, MacDonald, London, 1962. 11 Sidney Nolan, quoted in Elwyn Lynn and Sidney Nolan, Sidney Nolan – Australia, Bay Books, Sydney, 1979, p. 13. 12 Elwyn Lynn Papers, Art Gallery of New South Wales, from a tape recorded April 21, 1978 and from phone conversations in 1978, quoted in Nancy Underhill, ed., Nolan on Nolan: Sidney Nolan in his Own Words (New York: Penguin Group Inc., 2007), p. 267. 13 Max Harris, Introduction to Angry Penguins, and Realist Painting in Melbourne in the 1940s, Australian Exhibitions Touring Agency, Canberra, 1989, p. 6 .